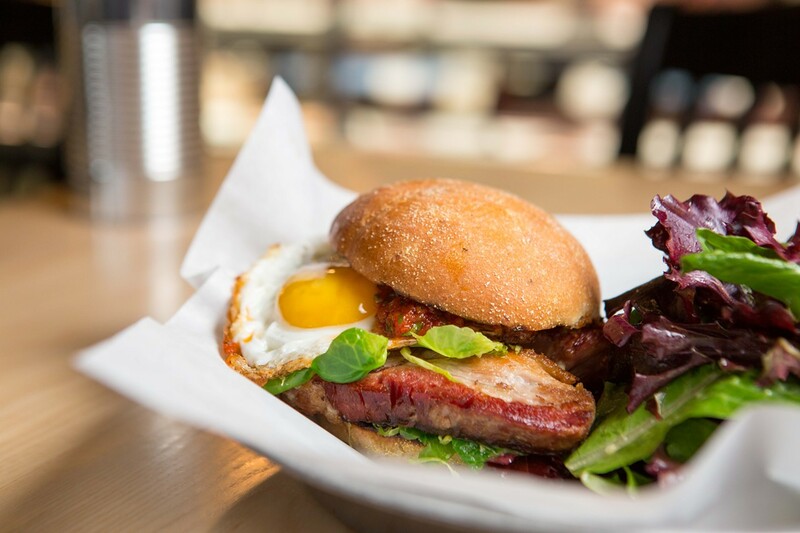 The sandwiches are the star attraction at butcher shop Clove and Hoof. The braised pork belly sandwich was as soft and luxurious as you can imagine. Hours: Wed.-Sun. 11 a.m.–6 p.m. When you first walk into Clove and Hoof, it looks the same as any of the other casually ambitious, DIY-minded restaurants that now dot Oakland like so many bright, shining stars — or Edison bulbs, as the case may be. To your left: a big cow's head mounted to the wall, and shelves lined with jars of house-made hot sauce, pickled vegetables, and every conceivable kind of animal fat. To your right: a slightly cramped, seat-yourself dining area, at which you'll see a mixed crowd chowing down on some of the most decadent, meat-centric sandwiches in town. 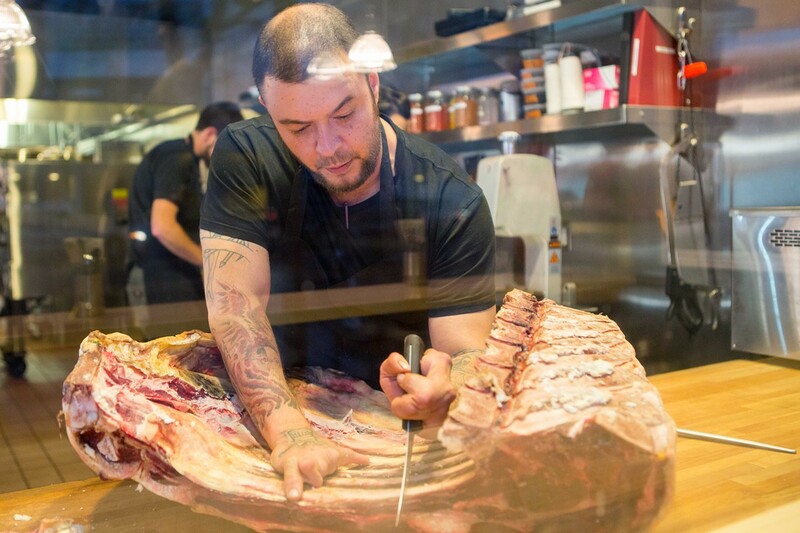 Like many restaurants of this ilk, Clove and Hoof boasts an open kitchen, but what's front and center is something else: a display case filled with oversized pork chops, whole culotte roasts, and other assorted cuts of meat. 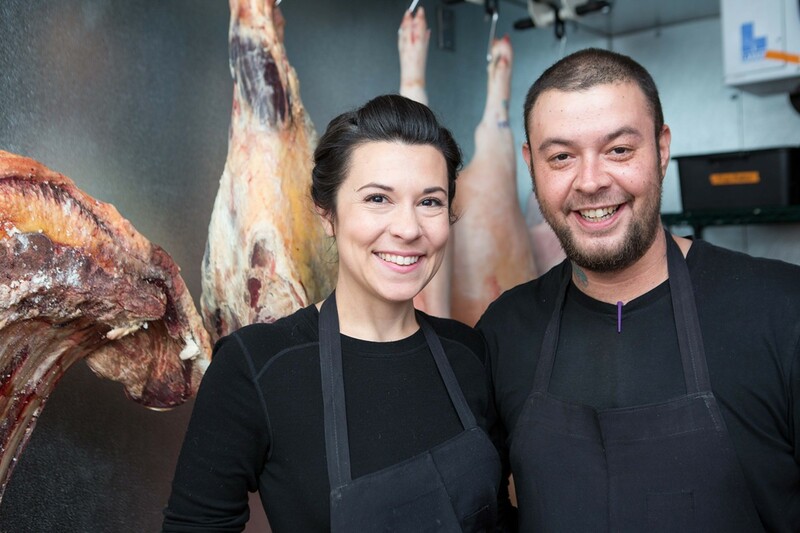 Oakland's self-described "butchery restaurant" is the brainchild of co-owners Analiesa Gosnell and John Blevins, the latter of whom also doubles as the chef. 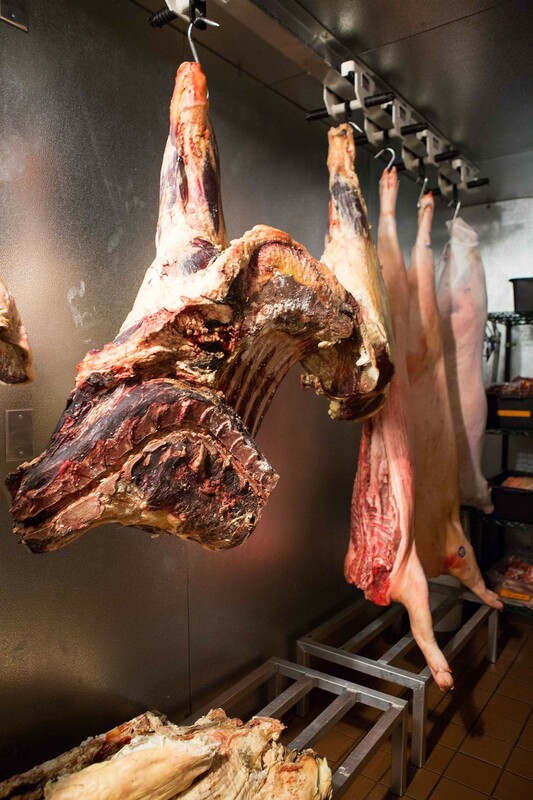 Clove and Hoof is a full-service butcher shop that handles whole, sustainably raised animals (broken down into recognizable cuts of meat on site) exclusively. And it is also a fully equipped restaurant — when the deep fryers and immersion circulators get as much mileage as they do here, you aren't just dabbling in sandwich-making. Conceptually, the restaurant falls somewhere at the intersection of "so obvious that it isn't clear why everyone else isn't doing it" and "so crazy that it just might work" — crazy in the sense that Gosnell and Blevins have essentially started two new businesses instead of one. Obvious because everyone benefits: Conscientious diners get an added layer of certainty about where their meat is coming from. And the business is able to sustain itself by taking hard-to-sell cuts of meat and turning them into delicious stews, sauce bases, and sandwich components. There's some precedent for the model, but no one in the East Bay has taken the restaurant-butcher shop combo quite as far as Clove and Hoof. 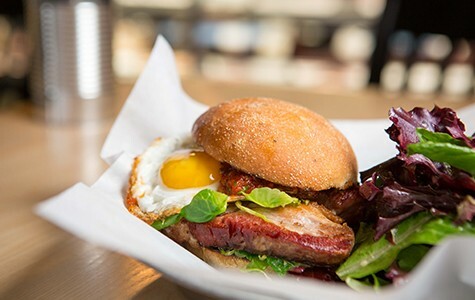 Nearly every menu item — mostly sandwiches for now — highlights some underutilized cut of meat. The restaurant's take on a double cheeseburger made use of assorted extra trim, which helped boost the patties' fat content up to a decadent 25 percent. I dug the coarse grind of the beef and the crispy, charred edges, as well as the oozy goodness of a house-made pimento cheese — Blevins' nod to his Southern upbringing. The sides were similarly great, and, for the most part, similarly meat-centric. The French fries, fried in a mixture of beef tallow and rice bran oil, were textural perfection — some of the best I've eaten in a while. And the chili was a knockout: pleasantly spicy and made up mostly of meat — stewed beef shank and big chunks of ground chuck that had the juiciness of a good meatball. It should come as no surprise that a vegetarian might have a tough time here, though Blevins said he tries his best to be accommodating. The menu features a "lager-steamed broccoli" sandwich, which comes with a beer cheese fondue (sorry, vegans). But what might be less widely known is that Clove and Hoof serves a damn good salad. The priciest of these — an $11 persimmon, apple, and arugula number — was perfect in almost every way, between the ripeness of the sweet persimmon, the crunch of the toasted walnuts, and, especially, the airy lightness of the blue cheese "crema," which had been discharged from an iSi whipper. (The menu is dotted with these kinds of modern touches.) The only flaw was that the greens were overdressed. But the best vegetable dish was a little plate of marinated beets that was dotted with pistachios, which added their nutty sweetness, and cubes of pickled watermelon rind with the texture of a crisp apple — a sour, juicy burst to punctuate every few bites. For now, though, Clove and Hoof is mostly all about the sandwiches, and it wouldn't be an Oakland sandwich shop without its own version of a fried chicken sandwich. Blevins cooks boneless breasts sous vide before frying, yielding results that are admirably moist and plump — so plump that you almost have to eat the sandwich with a knife and fork. I liked the smoky sweetness of the fish sauce caramel condiment, but a scattering of pomegranate seeds was perhaps one garnish too many. Better was a Middle Eastern-inflected meatball sandwich heavy on the turmeric and cumin, with a tasty chermoula-infused tomato sauce. And, while it's hard to pick a favorite, the sandwich that stood out the most was a special that featured obscenely tender slices of braised pork belly, as soft and luxurious as you can imagine, with some shredded Brussels sprouts for a bit of vegetal crunch. What I like about Clove and Hoof is the casualness of the place, which reminded me, as much as anything, of the kind of bustling old-school Italian deli that you'll find in certain cities on the East Coast. In spite of the length of the lines and the ambitiousness of the menu, the restaurant didn't give off a sense of self-seriousness. It helped that the service was sunny and enthusiastic. Soon, the restaurant will open on Tuesdays, too, and eventually for a couple of hours longer each evening. Blevins said he hasn't decided yet what dinner service will look like. It might be that the menu will stay more or less the same, with an occasional whole-animal-themed special prix-fixe to keep things interesting. I'm not sure what kind of dishes Clove and Hoof will serve, liberated from the vocabulary of sandwiches and things-to-eat-with-sandwiches. But it's fun to imagine — especially if pork belly is on the menu.